In the wake of financial scandals in the Gem State’s education world including the multi-million broadband fiasco, citizens have a right to be leery about cozy relationships between government entities and their business partners. This entry was posted in charter and tagged Albertson Foundation, Idaho Public Charter School Commission, IPCSC, John Hall on August 21, 2016 by Levi B Cavener. This is part 2 of a multipart series. I encourage all readers to also view part 1 here. Unfortunately, the red flags continue to stack upon the previous five detailed yesterday for Pathways in Education’s (PIE’s) charter application. Red flag six: The student-teacher ratio is astronomically high for an alternative school. The budget allocates for only 6 FTE classroom teachers. At an anticipated enrollment of 300 students, that results in a bloated student-teacher ratio of 50 to 1. Fifty to one. This ratio would be considered much too high for a public school in general; however, for an alternative school in particular in which the focus is on small class sizes and additional interaction time for each individual student, this ratio is obtusely top heavy. See page 207 for more information. This entry was posted in charter and tagged Caldwell School District, Charles Stout, Education in Motion Inc, Kent Marmon, Lisa Bevington, Pathways in Education, Pathways Management Company, Thomas Briten, Travis Manning on May 10, 2016 by Levi B Cavener. Caldwell School District has received a fresh application for a proposed charter school. This particular proposal for the charter entity Pathways in Education is interesting in the sense that not only will it will be the first time that Caldwell will consider a possible alternative high school under a charter, but it will also be the first time that Caldwell will consider paying an outside “consulting” company in order to manage the charter. Pathways in Education (PIE) is the latest of a series of charter schools promoted and managed by married former Hollywood teachers John and Joan Hall (their daughter, Jamie, and son, John Jr, are also both intricately involved in the family enterprise). This entry was posted in charter and tagged Caldwell School District, Charles Stout, Joan Hall, John Hall, Kent Marmon, Lisa Bevington, Pathways in Education, Pathways Management Company, Thomas Briten, Travis Manning on May 8, 2016 by Levi B Cavener. The following letter was sent out to all members of Idaho’s Lesgiature and members of the Idaho Public Charter School Commission. The letter asks for tangible action from either the IPCSC or the Idaho legislature to ensure minority services are provided in Idaho’s charters in order to make charter schools a choice for minority families as well. The actual PDF file version can be viewed here. This entry was posted in charter, Legislature and tagged Coeur D'Alene, Communidad y Justicia, Idaho Charter Commission on June 25, 2015 by Levi B Cavener. 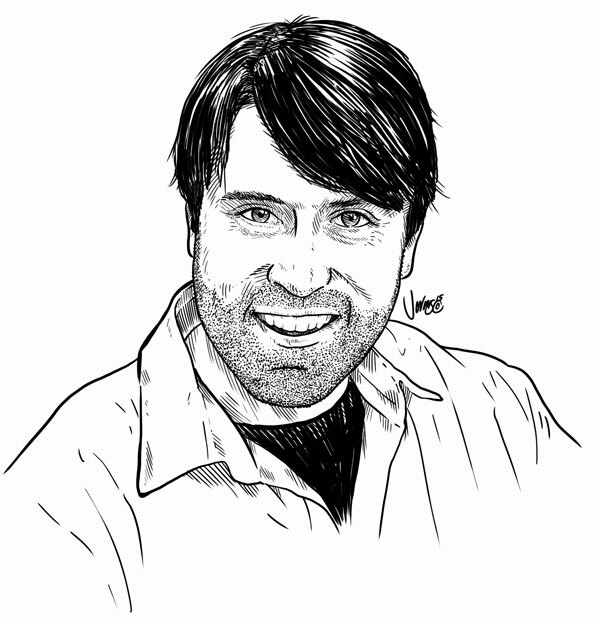 I don’t know about the caricature, but the interview is pretty darn good. It’s worth checking out. Teaching is a passion. Teaching students with disabilities is doubly so. Levi Cavener, an instructor at Vallivue High School in Caldwell, has been a special education instructor for five years. As an undergraduate at the University of Idaho, he spent time abroad through the Camp Adventure program, exploring Europe with children whose parents were serving in the military. One child lost a parent during Cavener’s time in the program and he described others as “genuinely alone,” not hearing from parents for weeks on end. Those experiences helped ignite his passion for education. This entry was posted in charter, General, High Stakes Testing, sbac, Special Education, Tiered Certification and tagged Boise Weekly, Cavener, Charter, SBAC on June 24, 2015 by Levi B Cavener. 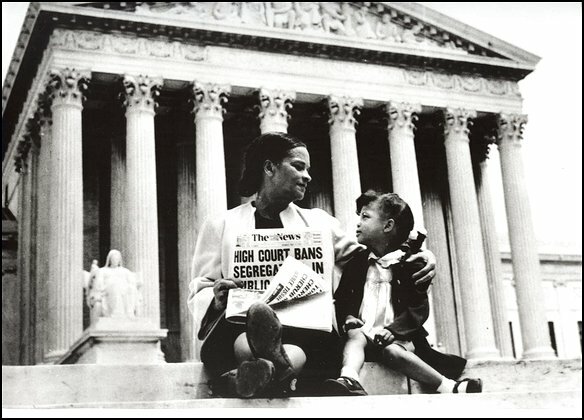 On the supreme court steps, a mother explaining to her daughter the impact of the Brown v Board of Ed Decision. Via Library of Congress, Prints and Photographs Division. Today marks the 61st anniversary of Brown v Board of Education; while many point to this decision as ending black segregation in southern schools (which certainly is true), the implications of this US Supreme Court decision were much far more reaching. The high court’s decision impacted minority students in general; the ruling has been used in order to integrate students not just with different skin colors, but those students who speak different languages, practice different religions (or no religion at all), or who have disabilities. Unfortunately, a few weeks ago Idaho’s State Charter Commission released its first ever annual report regarding student enrollment demographic data at Idaho’s charter schools. The depressing data indicated that minority students (of all kinds) were largely left out of Idaho’s charter schools. With few exceptions, the Commission’s findings indicated that charters in Idaho were not reflective on the communities’ demographics; instead, minority students were largely absent in public charter schools, even in areas of high minority populations (e.g. areas of high Latino and Spanish-speaking student enrollment). This report barely made a dent in the news cycle; as far as I can gather only IdahoEdNews and a short blurb from Betsy Russell via her online blog mentioned the findings. I had already been blogging and writing about the disparity in minority enrollment at Idaho charter schools via several information requests for enrollment data from the Idaho Dept. of Education. 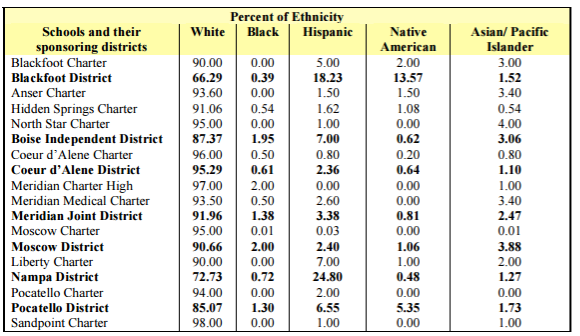 Those posts explored in detail how non-white students, special education students, and Free/Reduced lunch qualifying students were disproportionately left out of charter schools in comparison to the surrounding school districts’ enrollment demographics. Prior to the State releasing it’s own report, I wrote an OpEd published in various outlets including IdahoEdNews exploring some of the disparity in student enrollment, particularly in Canyon County where I live. 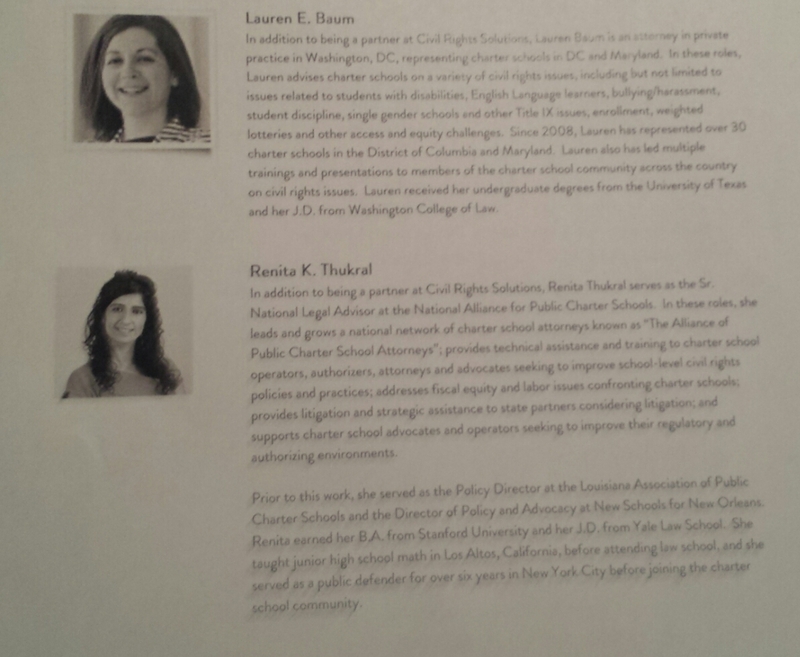 That writing was met with a competing essay by Amy Russell, Communications Coordinator for the Idaho Charter School Network (the lobbying arm of Idaho’s Charter Schools). Ms. Russell not so subtlety suggested in her writing that I had cherry-picked data “that do not fully represent the variability that takes place” from school to school I chose to include which led to a biased and inaccurate reflection of Idaho’s charter school demographics. Terry Ryan, President of the Idaho Charter School Network, went one step further and explicitly accused me of cherry-picking the data I utilized in the column. In any case, shortly after those competing sets of writings were published, the Idaho Charter Commission released its own independent report which dispelled any doubt regarding the wild imbalance of charter school demographics in comparison to their neighboring traditional districts. I also encourage anyone who cares to read the report’s companion, Understanding the Annual Report. That’s right, only 1 in 10 Idaho charters are reflective of the surrounding community’s ethnic demographics. The report prompted me to write a follow-up OpEd, also published across the state, sharing the report’s findings with citizens in Idaho. Again, that OpEd was met with competing writing from Idaho Charter School Network, this time from Terry Ryan. Sorry, but that “solution” strikes me as being counterproductive. See, we already have charter schools in locations with high populations of minority students. There is no need to build additional charters for minority students; rather, there is simply a need to make existing charter schools more inclusive. And while I can certainly sympathize with funding structures that make it difficult for charter schools to build facilities, charter schools in Idaho have managed to build facilities that largely are not sharing in an equitable burden in providing special services for minority students including English Language Instruction and Special Education services. In other words, the facilities are already here. The problem is not that we need to build more; the problem is that we need to fix the ones already in place before we foolishly continue building more charters and exasperate the issue further. As mentioned earlier, this week marks the anniversary of the US Supreme Court Brown v Board decision; I find it only appropriate in the wake of the Charter Commission Report’s findings to ask for a moratorium on Idaho’s charter schools until we address the imbalance, and I wrote an OpEd declaring this position this week. Response to Intervention (RTI) programs for struggling students. In this polarized political environment our nation has found itself in, a question often presents itself querying how citizens came to be so far apart and not willing to engage in compromise. Part of answering that question directly relates to the ability to empathize with someone else’s opinion and viewpoint. The single best way to help cultivate empathy is to make sure starting at a young age that children have opportunities to interact with peers different from themselves; different languages, cultures, religions, family dynamics, and engagement with individuals with disabilities allows a student opportunities to build empathy for individuals different than themselves, an ability to understand points of view even if at the end of the day they do not agree. Unfortunately, it appears that charter schools are largely denying students this opportunity; instead, data demonstrates that Idaho’s charter school environments a largely monocultures of homogenous student groups. Isn’t it time to do something about it? This entry was posted in charter and tagged Amy Russell, Charter, Idaho Charter Commission, Idaho Charter School Network, Terry Ryan on May 17, 2015 by Levi B Cavener.